1981 became Ruairí Óg Cushendall's greatest year when they beat Ballycastle by one point after a replay to win the Antrim Senior Hurling Championship for the first time ever! Cushendall went on that year to win their first Ulster title beating Portaferry of Down in the Final. In 1984 despite being runners-up to Ballycastle in both the League and Championship, Cushendall won the unique Centenary Cup played to celebrate the centenary of the Cumann LuthChleas Gael. Cushendall confirmed their status in Antrim hurling by winning the Antrim and Ulster titles twice more during the 80's. Unfortunately they were unsuccessful at All-Ireland Level, losing to Mount Sion of Waterford(1982), Buffers Alley of Wexford (1986) and Midleton of Cork (1988). 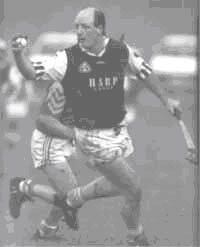 In 1989 Cushendall had the honour of having James Mc Naughton, Danny Mc Naughton, Terence McNaughton and Leonard McKeegan represent Antrim in the All-Ireland hurling final defeat against a Nicholas English-inspired Tipperary. Danny McNaughton was selected as a replacement All-Star in 1988 followed by Terence McNaughton who won a place an the 1991 All Star team at midfield. Despite a four year lapse Cushendall returned to the top winning 3 Senior Championships in a row: 1991,1992 and 1993 - yet another landmark in the club's history. Ruairí Óg added its seventh and eighth senior titles in 1996 and 1999 respectively. Unfortunately success at All-Ireland level still evaded the club culminating with a rock-bottom defeat by London champions, Desmond's.. However losing to Clare champions Wolfe Tones, Shannon by 1 point in 1997 and by 5 points to defending champions St Josephs Doora-Barefield from Clare after a replay in February 2000 offered hope for the future. In the 90s Cushendall won several Under 12, Under 14,and U16 titles: and in 1993 regained the Minor title after a lapse of 30 years. The team that won the 1993 U14 title went on to represent Antrim in the All Ireland Feile competition and were crowned Division 3 champions - the club's only All Ireland title to date. This team added a third Minor title to the list of honours in 1997 and then in 1999 won Ruairí Óg's first ever U21 crown. Off the pitch, 1995 was a big year for Ruairí Óg CLG because for the first time ever they actually owned their pitch. With a substantial financial input from the local community, the club purchased the local playing fields from Moyle District Council. The purchase was completed in 1995 and shortly afterwars the main pitch was re-developed and the pavilion renovated.